Ski-Doo’s new 2015 Summit X with T3 package features some unique technology in its Pilot DS 3 skis. 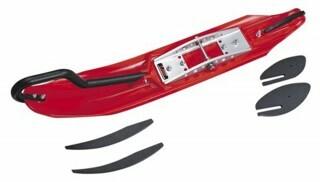 According to BRP, these sleds will come with a removable wider ski tip for tuning the handing in different snow conditions. This removable flotation extension slides onto the tip and is held in place with two bolts. The Pilot DS 3 skis are a variation of the Pilot DS 2, but with a 12mm deeper keel. Up front, a narrower shape is designed to reduce tip‐up. As well, the ski features redesigned top side bracing. BRP boasts that riders will find it holds a sidehill better. The key to the adjustable nose is to reduce the tip‐up that can slow down the vehicle. In snow conditions with less than 16 in. of fresh powder, and especially when there’s a crust, BRP says the narrow tip will stay in the snow and not want to pop-up, which helps to maintain a carve. As well, the narrow shape is designed to move the impact point – where a change in snow density acts to tip-up the ski – more towards the spindle. 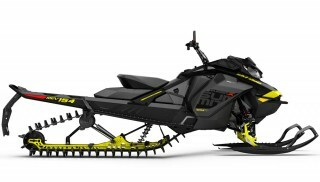 BRP says this reduces kick back by 50% compared to the wider configuration, minimizing its impact on the attitude of the sled holding a sidehill. In snow conditions of more than 16 in. of fresh powder, BRP says the wider tip configuration is more desirable, as it increases flotation to bring the nose of the sled up. If you don’t plan on buying a new Summit X with T3 package, BRP says you can purchase the DS 3 skis separately for your own sled.